For one charismatic kid, the dangerous world of the Forest of the Dead becomes the setting for the ultimate escape trick in this exciting debut novel. Jack Carr has been shuttled from foster home to group home to foster home his entire life. The only constant has been his interest in magic, especially handcuff escapes like those mastered by his hero, Harry Houdini. When he's placed with the Professor, however, he feels like he's finally found a homebut his new guardian is hiding a dangerous secret. Years ago the Professor bartered his soul to the undead magician the Amazing Mussini, and when the payment is due, he sends Jack in his place. Jack must travel with Mussini to the Forest of the Dead, a place in between the real world and the afterlife, where he's forced to perform in Mussini's traveling magic show. If he stays in the Forest long enough, he'll die himself. To find his way home, he'll have the help of Mussini's other "minions"kids stolen just like Jackand his wits, nothing more. Can he follow the example of his hero, Houdini, and escape the inescapable? 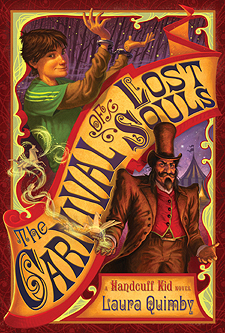 "The Carnival of Lost Souls was the perfect book for me. I loved the blend of creepiness, suspense, mystery, and humor. It sucked me in and made me feel like I was really there in the Forest of the Dead. Kids and adults alike should read this book!" "Laura Quimby fashions a creepy-cool world, brimming with danger and magic, weaving together carnivals, the Amazing Houdini, and elements of myths. It was a pleasure to follow Jack, the Handcuff Kid, into this world and get lost in it. Here's hoping this is just the first of many Handcuff Kid tales."